By ordering from Taco Mini Bikes, you are agreeing to all terms and conditions as shown below. These ordering terms are printed on your invoice, accepted and signed electronically by ordering from Taco Mini Bikes. If you are a new enthusiast, welcome to the exciting world of Powersports. You should know that powersport products require substantial mechanical support to uncrate, setup, adjust, maintain, repair and upgrade. This support is required on an ongoing basis. These activities apply to a used product as well as an item brand new out of the box. We strongly recommend that a qualified mechanic perform the setup and all other mechanical operations to keep you product operating properly and safely. Taco Mini Bikes does not provide mechanical services and labor is not covered under manufacturer's warranty under any circumstances. Additionally, manufacturers may require proof that a product was setup by a qualified mechanic in order to provide warranty coverage. From time to time, manufacturers or suppliers either raise prices or upgrade the products, and these changes may not be shown on the website immediately. This is why the products may differ slightly from what is shown. However all changes are usually to improve or update the product, and does not lower the quality of the merchandise. Color choices are requests only, subject to availability and cannot be guaranteed. Parts and products ordered from this website should be installed/setup by a qualified mechanic. Consult the manufacturer of the part or product for its proper use and operation. Customer assumes all responsibility for setup and maintaining products and/or equipment in safe operating conditions. Products are to be used only in the manner intended and with proper safety equipment. Purchaser herewith acknowledges (a) Taco Mini Bikes assumes no liability for any misuse of any products sold and (b) Purchaser acknowledges that there is an inherent risk in the operation of Powersports equipment and all products sold on this website and herewith assumes all risk of any injury arising from the operation of any products sold on this website. The customer hereby indemnifies and releases Taco Mini Bikes and its affiliates from any and all; actions, cost, damages, expenses, liabilities, and attorney fees which could arises from the purchase of one of our products whether or not expenses are caused due to negligence of the distributor, manufacturer, or the seller. The customer hereby agrees to waive any right to exercise any legal actions seeking damages from Taco Mini Bikes and its affiliates. There is NO WARRANTY OR LIABILITY EXPRESS OR IMPLIED, NO IMPLIED WARRANTY OF MERCHANTABILITY OR FITNESS FOR A PARTICULAR PURPOSE. This agreement shall become effective immediately after any purchase of any of our products. The customer has read and agrees to all our order terms, if questions occurred the customer contacted customer support for answers. Any disputes hereunder shall be resolved in the county of Orange, California. PLACE AN ORDER THROUGH OUR WEBSITE Follow the steps in the shopping cart. Fill out the order form completely making sure that all spaces that apply are filled in and correct to make sure that you receive your order without delay. TELEPHONE ASSISTANCE Although we cannot take an order by phone, we can assist you in placing an order, call our customer service department at (800) 564-8226 Monday through Friday between 9:00am and 5:00pm PST. Use your Visa, MasterCard or Discover Credit Cards. MAIL IN ORDERS Sorry, we do not accept orders by mail. CREDIT CARD ORDERING WE SECURITY CHECK ALL CREDIT CARDS. We accept Visa, MasterCard and Discover credit cards. When placing orders, you must have the following information from the credit card: We need the expiration date, the credit card number, the cardholder's phone number for the home & where they can be reached during the day, the credit card owner's name and billing address. CHECK PAYMENTS We do not take Check payments. WIRE TRANSFER Large purchases exceeding the credit limit amounts that can be placed on a credit card can be paid via Wire Transfer. ALL INTERNATIONAL ORDERS Must be paid via Wire Transfer. In order to avoid delays in shipping your order, please send all International Wire Transfers in GUARANTEED US FUNDS. Sorry, we cannot accept credit card payments on International Orders. C. O. D. SHIPMENTS We do not ship C.O.D. HANDLING CHARGE: Some large items may present a small handling charge for a rolling pallet or special packaging materials. ORDER DELIVERY: Taco Mini Bikes CANNOT GUARANTEE EXACT DELIVERY DATE of an order. Small items are shipped via USPS or Fedex and should arrive within 7-10 business days. Some orders may take longer. You will receive an email notification when your order ships. Customer is responsible shipping to a secure location. Customer can order Express shipping to require a signature at delivery time. Items lost or stolen after delivery will not be refunded and no replacement order will be sent. Customer can file a claim with the shipping company. Large items are shipped via Truck Freight and may be delivered within 7-10 business days. Delivery time for some items may be longer. The total time to receive your order can be approximately 1-3 weeks or longer during busy times of the year. Order early if you have a specific date requirement. TRUCK FREIGHT SHIPMENTS: Large items will be shipped to your home, business or the nearest trucking terminal. Tracking numbers are not provided for Truck Freight shipments. The Freight Company will call you to schedule a delivery or pickup. The driver will generally help get your product off of the truck. Be sure to select "lift gate" service on large items if you need it. On heavy merchandise, it's best to have someone available to help unload it and get it into your garage. Some large items cannot be delivered to your home and may require that you pickup the item from the nearest freight terminal. If this is the case, the freight company will place the item on your truck or trailer for you. In some rare areas, there may be an extra charge for home delivery or other services. We will let you know if this applies to your order. WARNING: Taco Mini Bikes and Parts are machinery. They must be maintained and treated accordingly, and can be dangerous. They have moving mechanical parts. You should not have loose clothing, long hair, hands, or other parts of your body around moving parts. Buyer assumes responsibility to wear all Proper Safety Gear while Operating the Mini Bike. This includes but is not limited to a Helmet, Gloves, Shoes and Eye Protection. Read all manufacturers safety precautions that come with the vehicles. Serious injury or even DEATH can result from operating these vehicles. Customer hereby assumes all risk associated with the setup, operation, use or maintenance of any products purchased. Customer further agrees to release and hold harmless Taco Mini Bikes and /or it's employees, owners and affiliates and exempt from any liability for any injury or loss as a result of operating any products purchased. Customer hereby agrees to follow all safety, setup, operation, maintenance and warranty information or procedures, printed or otherwise provided by the manufacturer. If this information is not shipped directly with the product, customer agrees to contact manufacturer to obtain the information. Customer is responsible for obtaining all safety, setup, operation, maintenance and warranty information, if any, directly from the manufacturer. SETUP AND MAINTENANCE: Some of Taco’s Products require assembly and/or setup and is not provided by Taco Mini Bikes. Customer is responsible for all product assembly, setup and maintenance. Customer hereby agrees to have a qualified mechanic perform final assembly, setup and maintenance of your product. Our products are shipped directly to the customer from the manufacturer distribution warehouse. As such, the customer is responsible for all final product assembly and setup, as well as normal maintenance and repair at customer's own expense. 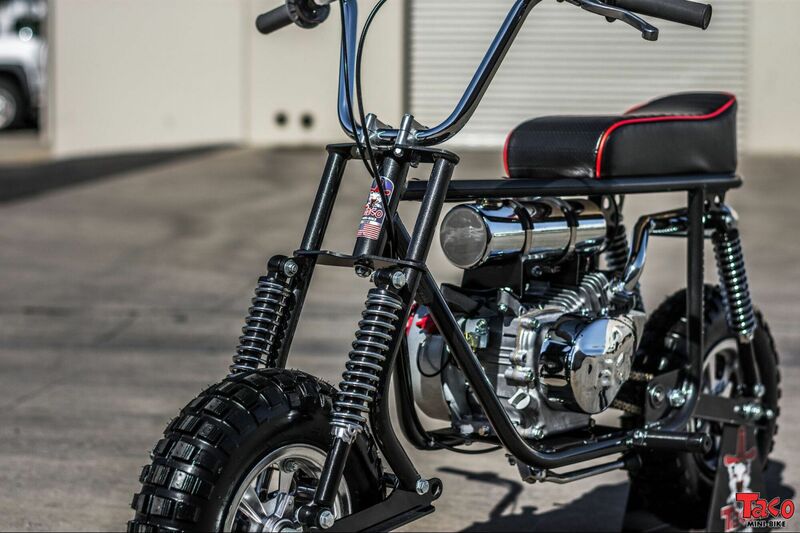 Taco Mini Bikes recommends and customer hereby agrees to have a qualified technician assemble and setup any product purchased on this website. Taco Mini Bikes will, upon customer's request, ship product to a Service Center of customer's choosing. Failure of customer to have a qualified technician perform setup could void warranty. If a setup or maintenance task is beyond the expertise of the customer, then the customer agrees to seek the services of a competent professional mechanic at his own expense. No labor charges for product setup, maintenance or repair shall be covered under warranty. Incorrect procedures or performance of procedures by persons not qualified can result in product damage and may void any warranty. We cannot refund or exchange your unit if you cannot perform these functions or refuse to let a shop do it for you. BACK ORDERS: If we are out of the item, part or parts that you ordered, we may back order the part. If the part is not available we will issue you a full refund on the parts not shipped. In some cases you may be charged an additional shipping charge for the back order shipment. WARRANTY: No warranty, express or implied is provided by Taco Mini Bikes. Some products may carry a warranty from the manufacturer. Any warranty offered by a manufacturer is from that manufacturer and not Taco Mini Bikes. Taco Mini Bikes will assist any customer should a warranty issue arise. For products whose manufacturer offers a warranty, that warranty shall cover defective Parts Only and not labor. Warranty does not cover shipping. All warranty procedures that the manufacturer requires must be followed, no exceptions. Any part or accessory that is covered by a warranty MUST be returned to the manufacturer for inspection BEFORE an exchange can be issued. Customer pays for shipping of parts to and from the manufacturer. Contact Taco Mini Bikes for details and further instructions if you think you have a warranty situation BEFORE you do anything. Any warranty that comes with a vehicle spells out the warranty and time periods. If you have any questions call Taco Mini Bikes and we will help with the warranty. HELP REQUEST: If you need assistance or feel you may have a warranty situation, please complete a Help Request in the customer service section of our website. Follow the instructions completely. We will assign an Adviser to assist you. This is the easiest and best way to obtain support. RETURNS: You may return most items (except vehicles, kits, special order items, or items marked on our website as non-returnable) for a prompt refund. Items returned within 21 days of delivery will be credited in the same form as the original payment type or store credit redeemable on future purchases. Returned items must be received in our warehouse within 14 days after return initiation. Items must be returned in new or unused condition in original packaging and contain all original materials included with shipment. No return will be accepted unless the RMA number is displayed. We will provide you with the correct return address for your particular item(s) when we process your RMA Request. Items sent to the Wrong Address will not receive a refund. All returns must be shipped freight prepaid by the customer. No return shipment will be accepted unless the freight has been prepaid by the customer. Returns shipped freight collect will be refused and returned to the customer, or discarded. After inspecting the returned merchandise, we will reimburse the purchase price of the item, less all actual shipping costs. No refund shall be issued on damaged or used items. All items are subject to a restocking fee. If you refuse delivery, miss your delivery appointment or return a non-defective, undamaged or incorrectly assembled product, you will be charged for all original and return shipping costs. Items returned as damaged or defective are inspected and tested upon arrival. Items may also incur a 20% restocking fee. Returns accepted as a courtesy for non-returnable items may incur up to a 50% Restocking charge. No item may be returned if unpacked, assembled, had fuel installed or operated. No returns after 21 days of delivery. Return shipping fees range anywhere from $100 to $695, depending on the size and weight of the item. Return shipping fees should be paid directly to the freight carrier in advance. If not paid in advance, your return may be refused and/or shipping fees may be deducted from your refund after the item is received at our warehouse. Items cannot be returned once they are opened, unpackaged, assembled, used, had fuel installed, damaged, or altered. The customer is responsible for all shipping, handling, and restock fees on all Mini Bikes and parts refused or returned after they are shipped. Although we may provide free shipping on many large items, these items are very costly to ship. 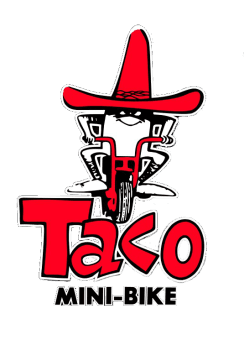 CANCELLATIONS: Customer acknowledges and understands that Taco Mini Bikes has incurred expenses in processing customer's order. If you cancel your order for any reason, there is no cancellation fee if your order has not been processed. Processed orders cancelled by the customer prior to shipping may incur a 6% cancellation fee. A restock charge may apply on some items and special order items cancelled prior to shipping. Orders cancelled by the customer after an order has shipped will be refunded less all actual outgoing and return shipping charges plus restocking fee. REFUSED SHIPMENTS: Customer will be charged all actual destination and return shipping charges on refused shipments. All refused shipments or returned items are subject to a restock fee. Customer is responsible for all shipping charges, including shipping charges on parts that the customer orders incorrectly and orders canceled after shipping. No returns will be accepted on used, damaged, altered OR SPECIAL ORDERS. Merchandise returned to Taco Mini Bikes will be returned to you at your expense or discarded & no credit will be issued. SHIPPING DAMAGE: The Packaging is designed to absorb damage and protect the merchandise. Minor damage, scratches missing items can be easily handled. Just complete a Help Request and we will send touch-up paint and/or other items. When you receive your order and there is major damage to the merchandise, please tell the delivering carrier and have them note this on their freight bill. This will protect you if you have to make a claim. ALL DAMAGE CLAIMS MUST BE HANDLED BY YOU DIRECTLY WITH THE DELIVERING CARRIER. They are responsible for shipping damage, not Taco Mini Bikes. We will assist you with a damage claim. Before signing the shipping receipt at the time of delivery, carefully open the package and inspect items for any major damage or defects. Upon delivery, if you notice any major damage or defects, you must note them on the shipping receipt and refuse delivery before the delivery person leaves. Do not accept delivery unless you intend to keep the product as shipped. Please notify Taco Mini Bikes immediately. Items returned will be inspected for damage and any refund or credit will be issued, less any Return Fees. Items returned or refused due to minor damage/scratches or non-defective, undamaged items will be charged all shipping and return fees as appropriate. CREDIT CARD CHARGE-BACK POLICY: By purchasing a product from Taco Mini Bikes, the customer agrees to waive his rights to file a charge-back under any circumstance. The customer agrees to handle all issues with our customer service representatives in accordance with all of Taco Mini Bikes policies. Charge-backs are expensive and very time consuming for both ourselves and our customers. Issues can be resolved in a timely fashion by allowing our advisers to work with you. If customer files a Charge-back, we may add collection, legal and attorney's fees, interest and other charges to an overdue account. Additionally, we may report any delinquency to national credit bureaus and collection agencies. Finally, we may initiate legal proceedings to recover monies due on any delinquent or unpaid account. BREACH OF CONTRACT: These terms and conditions serve as the only and final agreement between Taco Mini Bikes and the customer. In the event the customer breaches this contract, the customer agrees to pay any and all costs associated with removal of any negative public communication, images, or material that violate the law regarding Taco Mini Bikes, its employees, affiliates and its associates; including but not limited to any legal and associated costs. WE RESERVE THE RIGHT TO CORRECT CATALOG & WEBSITE ERRORS. Taco Mini Bikes does our best to make sure that information and photographs posted on our website are accurate. Sometimes manufacturers make changes to a product before we are able to post updated information on our website. When changes to products are brought to our attention, we will make a diligent effort to update our website, however, we cannot be responsible for errors or omissions posted on our website. PRICING POLICY: Prices and specifications in the catalog and on this website are subject to change without notice and supersede previous catalog & website prices and specifications. If there is a small price increase, we will adjust your order accordingly. On major changes, we will contact you before your order is shipped to inform you of the changes. **receiving this document will serve as your electronic signature that you agreed to the terms prior to purchase.